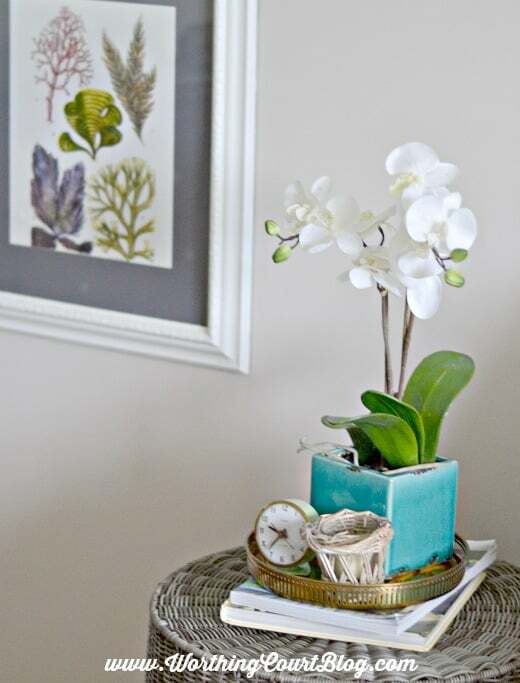 Decorating with trays is the ultimate decorators secret weapon. I’ve been using them for quite a while, but never realized how many I had accumulated until I was starting to gather things together to pack for the move to the new house. 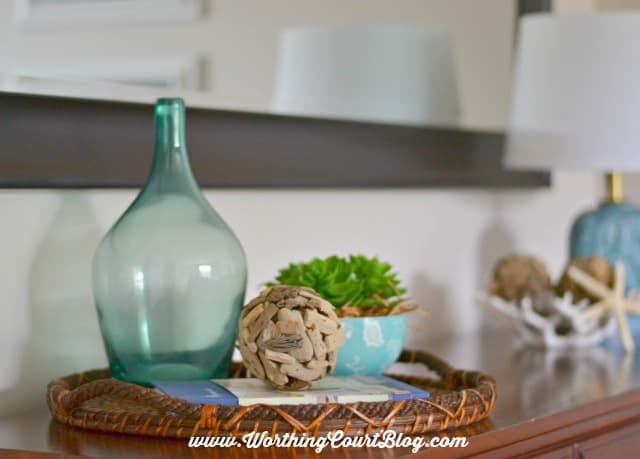 The objects grouped on this round tray in my neutral and aqua guest room wouldn’t make much of a statement if they were placed directly onto the surface of the dresser. It doesn’t matter the size or shape of the tray or if it’s made from wicker, metal, wood or something else. In that same bedroom, I’ve used a vintage brass tray that I found at a local thrift store. They add importance to any objects that you group together and help to get rid of visual clutter by grouping small items together. My collection of small pitchers would look like a hot mess if they weren’t corralled into a tray. 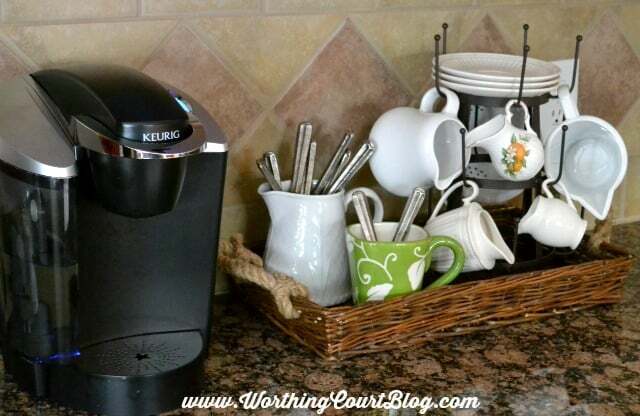 This type of collection works well as part of my coffee station. 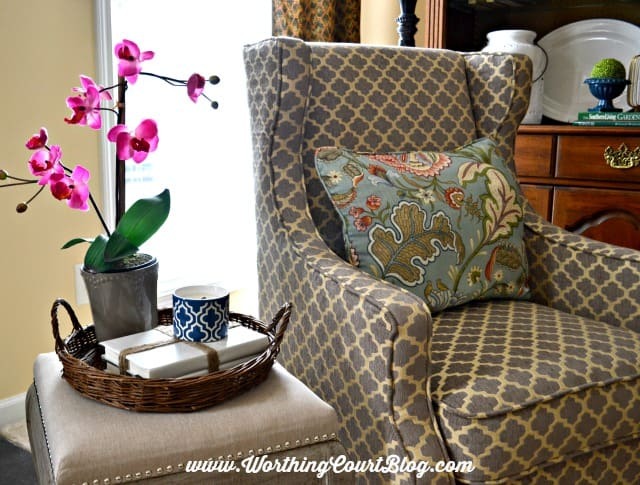 Another tray resides on a stool that I’m using as a little side table in my family room. I love to create interest by elevating smaller items on top of a stack of books. Here I wrapped a couple of books with plain white paper and tied them together with jute twine. I went a bit wild with trays on my coffee table. I placed a tray within a tray on the top. A ginormous tray on the bottom shelf holds decorative objects too. 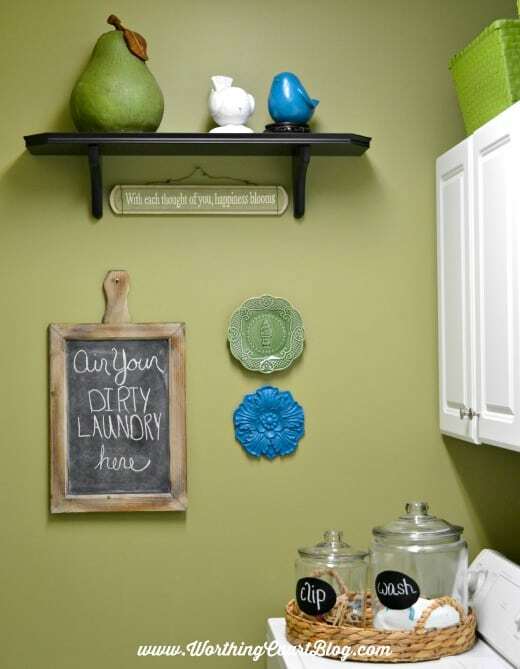 I even used a tray in my laundry room to hold jars of laundry detergent and clothespins. These are just a few of the trays that I’ve used around my house. 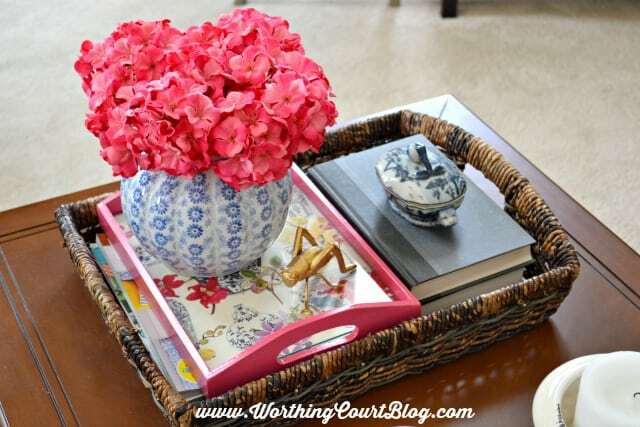 How about you – do you like to decorate with trays? I think I’m going to scrounge around our house and see what I can find. I love how you use yours! And I’m determined to make my laundry room more welcoming!! It looks pretty crude right now. Your trays look great, Suzy! 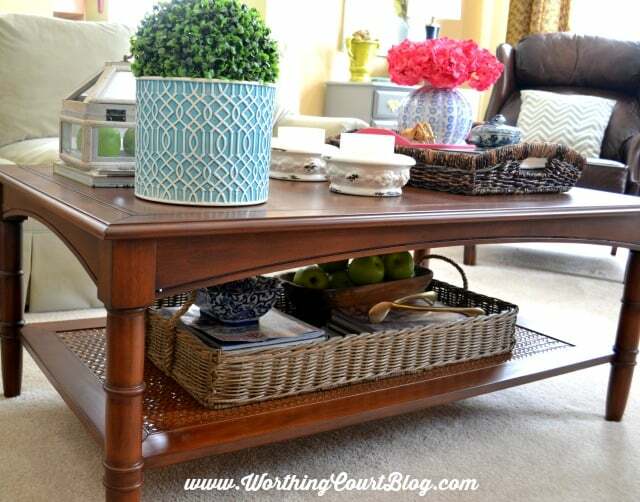 I love using them for vignettes in the kitchen and on the coffee table. Your vignettes are really pretty! Thank you, Shenita. I see you’ve been doing some fall decorating at your house! Great ideas Suzy, PINNED!!!! Starting to show the new house. Thank you, Cynthia. Going over to check out your house! As I read your post I am glancing around the room to see which items I need to corral onto a tray! Thanks for the ideas!! I was amazed at how different it made things look the first time that I tried using a tray. Have fun! I have so many trays but never use them. I’m always afraid that there would be too much visual clutter because I not sure how to style them. But I keep buying them anyway. After reading this I can see it doesn’t have to be that way. You have given me the courage to dig out those trays and give them a go, at least a try.